With spectacular architecture, a premium location and friendly, efficient service, the San Francisco Marriott Marquis provides the quintessential hotel experience. The hotel is just steps from the Moscone Center, Union Square and top attractions for both family and romantic getaways. Approximately 20 minutes from the San Francisco Airport. Across the street from Moscone Convention center. 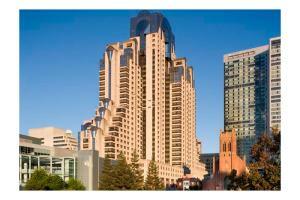 Within walking distance of Yerba Buena gardens, financial district, Chinatown and Union Square shopping. Atrium, Fourth Street Bar & Deli, The View, City Blends and Garden Terrace. The Moscone Center, Union Square, Chinatown, Little Italy, Fisherman's Wharf, Golden Gate, Sausalito, Ghirardelli Square.